Here in this case also we have use Jquery and Jquery UI. By using Jquery UI Dialog box we have get data from user and by using Jquery code we have converted that form data into HTML table and data has been stored in hidden field in array format. Here we can add multiple number of data and store into HTML table format. 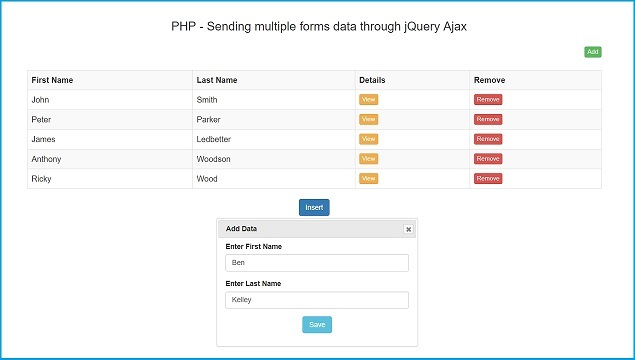 Now for submit multiple form data to PHP server script we have use Ajax web development request. By using Ajax we have send multiple form data to PHP script and in PHP we have insert multiple form data. So, Here we have insert multiple form data in single click of form submission. This is new challenge in Web Development with JQuery Ajax PHP. So, if you have developed any web application development and in that you want to add multiple data in single form submission then you can get reference from this PHP JQuery Ajax Web Development Code. I Cant under stand PDO, working only procedural. but your code is nice and clean. if you provide procedural code rather than PDO, I shall be very Thankful to you. Thanks. if its possible if i want to input it with select and option that connect to db mysql, not with an input text? if yes, can you tell me how to do that? but can you tell me how to save the insert.php in mysqli procedure? cause i don't really know about PDO. Thanks. hai bro in index.php where is the name column. I'm confused because the column names are the same with name="" and id=""
how to filter the first name Sir???? ?